Historically the biggest match in English football, the latest edition of this great rivalry served up the drama, controversy but overall the quality this fixture has become famous for. Whereas previously this match has decided titles, this game was key in the race for fourth with Manchester United only two points ahead of Liverpool before the first whistle was blown. Van Persie and Evans were unavailable for United, likewise with Ibe and Lucas for Liverpool. The biggest line-up shocker was Rodger’s decision to start Steven Gerrard on the bench, in what was to be his last match (or should I say last 40 seconds) in the North-West Derby. The starting line-ups. LVG’s favoured 4-3-3 for United, while Rodgers continued with a 3-4-2-1. Both line-ups remained the same until Liverpool switched to a 4-3-1-1 after Gerrard’s sending off. Man United in possession and Liverpool’s difficulties off the ball. Brendan Rodgers’ Liverpool have become known as probably the best pressing side in the Premier League. Van Gaal was all too aware of this and use his experienced tactical nous to make this work to his team’s advantage. United would invite Liverpool’s pressing on one side of the field, and then beat it using quick combinations, allowing them to switch to the other side of the field where they had more space. Said combinations were often made easy as a result of United’s passing triangles all over the field, something which Van Gaal mentioned in his pre-match interview as being important to him. He said how the 4-3-3 is the formation that best creates these triangles. Manchester United’s passing triangles in their 4-3-3 formation. The numbers show the passes exchanged between the two players along that line (i.e. Valencia to Mata 35 passes, Mata to Valencia 23 passes.). We can see United’s two key passing triangles. 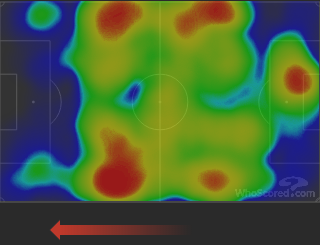 Liverpool getting sucked in during pressing, thus allowing United space, contributed to Man United’s opener. 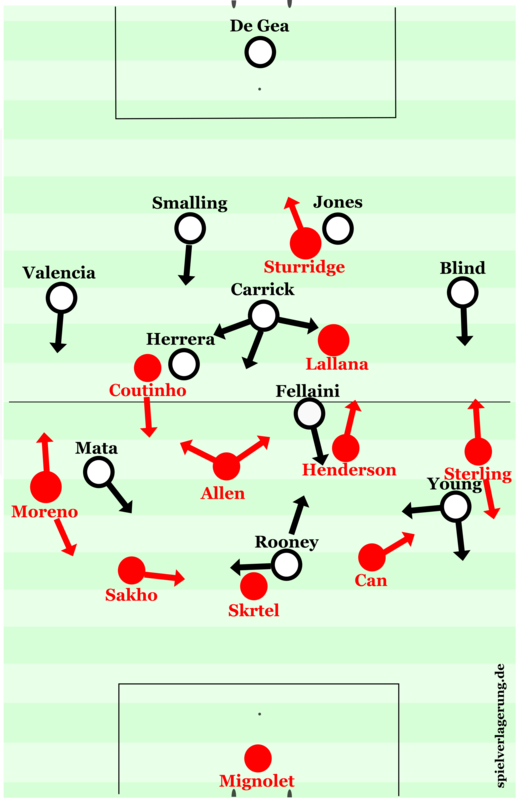 Allen and Henderson moved over to the right hand side of the pitch (tertiary press) while a pass from Jones to Fellaini beats Liverpool’s first (Sturridge on Jones) and second (Sterling and Lallana tight marking on near options) pressing waves. The rest is explained in the caption below. As Fellaini receives the ball, Herrera is in the open space left by Liverpool’s shift due to their press. Liverpool tended to play a pendulating back four when either Moreno or Sterling (usually Sterling) were very advanced. We can see this as Can has moved across into a RB position. Moreno, however is still in wingback mode, and is in a strange position, caught between pressing Valencia and marking Mata. This leaves a large space between him and Sakho. Herrera passes it into Mata who finishes well. 0-1 to the away side. Juan Mata was brilliant–man of the match by a long way. He was given more of a free role, often playing deeper and more narrow, meaning Sakho and Moreno were often left marking nobody. The Spaniard had the most touches, the best pass accuracy, and the joint 2nd most dribbles of any player on the pitch. He scored one of the goals of the season, an exquisite bicycle kick from Di Maria’s chipped through ball. Di Maria had quite a good match after coming on in the 55th minute, acting as a more effective box-to-box player than Young as Liverpool inevitably would leave space behind as they looked to get back into the game. He replaced Young at LW but his movement and passing was much more dangerous than Young’s. For United’s second goal, he contributed to a United 3vs2 overload with Fellaini and Rooney on Can and Skrtel. This meant he would not be followed when dropping to pick up the ball and assist Mata. Moreno yet again was indecisive and failed to either press anybody, or mark Mata. These 3v2 overloads were commonplace, with Fellaini often moving onto the last line to facilitate them. Liverpool played with a naturally very narrow formation, with four in central midfield area. United would often completely vacate central areas of the pitch during their build-up, focusing on building through wide areas. United building up through wide areas with emphasis on the aforementioned wide triangles. This tactic didn’t always work well for United however. In one incident, Liverpool pressed and won the ball wide, which allowed Coutinho to run with the ball into open central space, with nobody close enough to put him under pressure when tracking back. He had the time to pick out a pass to Sturridge who pulled a goal back for Liverpool, making it 1-2. Liverpool’s pressing did work on occasion, mostly when Carrick dropped between United’s CBs in their first build-up phase so they could press 3v3. This forced United to play long however they always aimed their long balls at Fellaini, who won a massive 11 aerial duels during the match (2nd highest was Skrtel with 5). Fellaini was very good in the match, continuing to answer his critics after his impressive performance vs Tottenham last weekend. He was a good physical presence in midfield, nullifying Henderson, probably Liverpool’s most physical player after Skrtel. Liverpool were poor when building up in the first and middle third. United’s good pressing, coupled with Liverpool’s sloppy, slow passing caused them to be dispossessed 21 times during the match (United were only dispossessed 6 times). 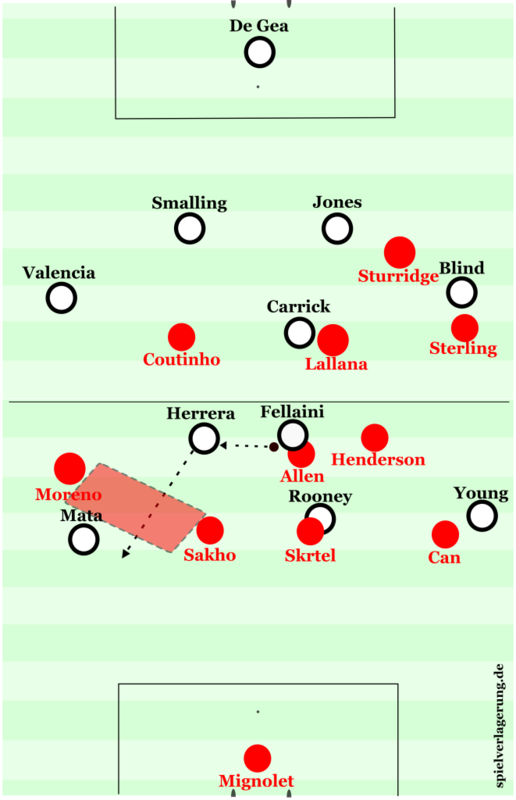 United’s 4-1-4-1/4-5-1 shape when Liverpool were in build-up worked well as it blocked passing lanes effectively, while also meaning that dropping Liverpool players could be followed tight as it would not leave much space open. As I have mentioned, Liverpool played in more of a pendulating back four, meaning Moreno and Sterling were hardly ever both high up the field at the same time. This is seen as one of the main attacking benefits of playing with wingbacks as it stretches the opposition defence and creates numerical superiority in all thirds but wasn’t utilised effectively by Liverpool. Sterling couldn’t really effect the game from his right wingback position and briefly moved into a no. 10 role in Liverpool’s post-Gerrard-sending-off 4-3-1-1 before being moved deeper after Balotelli came on. One of the only attacking nuances that worked for Liverpool was Sturridge’s wide movement in attacking transition. On one occasion, it helped open up central space for Lallana to receive the ball from Sturridge, only to skew his shot wide. It also gave Sturridge space to receive an assist from Coutinho for Liverpool’s only goal. It wouldn’t be exaggerating to say that Louis Van Gaal gave us a tactical masterclass in not only avoiding Liverpool’s pressing, but using it to his advantage too. United are now five points clear of Liverpool, but will also have their eyes on their other rivals, Manchester City, who they are still just two points behind. Liverpool weren’t quite as bad as I’ve probably made them out to be but may need a little re-think in tactics when they play top sides they looked very easy to defend against. Champions League qualification is now looking unlikely and Rodgers will probably leave at the end of the season if they don’t make the top four. It’s the 2nd part of the article after the Chelsea game. I think failing to finish in the top four after last season’s successes would be a massive disappointment and I doubt Rodgers would have the motivation to carry on at Liverpool if another club (Man City) came in for him. Very well written article, but I don’t understand the last paragraph, seems to me an unnecessary and somewhat hasty assessment of Rodgers and his potential with a very young and promising Liverpool squad. Thanks Mark, I just think failing to make it into the Champions League would be disappointing with the amount that was spent in the summer. I feel Rodgers would move onto someone like Man City if the job became available.